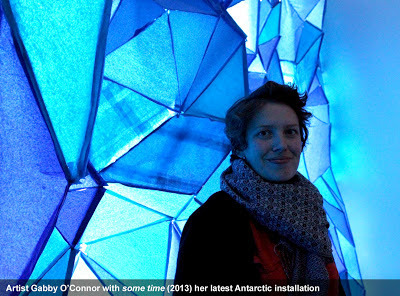 Artist Gabby O'Connor has long been fascinated by the history and physical nature of Antarctica which she reconstructs in her latest installation, some time, a luminous multifaceted sculptural interpretation of the edge of the Antarctic Ross Ice Shelf at the point of collapse. Made with thousands of tissue paper sheets the labour intensive installation has been entirely hand dyed and cut into individual geometric shapes, before being assembled. Painstakingly created some time represents the time it has taken to form the icy continent and now the speed at which it is melting. The materials of the installation being paper and light also reflect the immense and delicate ecosystem of Antarctica and the current effect of climate change. some time plays with the architecture of the gallery, invading the space with a foreboding glacial cliff face. The artist says, “the angles and geometries are a space to contemplate the nature of ice, our position in the world and the space we inhabit and the edges potential to transform unexpectedly”. O’Connor’s work reflects on Robert Falcon Scott and his crew's final and fatal expedition in Antarctica. The artist is intrigued by the Ross Ice Shelf for the slightly macabre fact that it will eventually calve off icebergs containing the bodies of Scott and his crew. In an earlier work, What lies beneath (2011) at the City Gallery Wellington, the artist constructed the rarely seen submerged part of an iceberg with the help of NIWA Oceanographer, Craig Stevens. Hand dyed and lacquered tissue paper, staples. Gabby O’Connor is a Wellington based artist with a practice grounded in installation. The artist holds a Master of Fine Arts from the University of New South Wales, College of Fine Arts. Since 1995 O’Connor has exhibited nationally and internationally in Japan, Canada, Holland, Australia and the UK. In 2011, she produced a solo exhibition What lies beneath at the City Gallery Wellington. This latest Antarctic installation is the first arts project in New Zealand to be funded by Boosted, a crowdfunding initiative for creative projects in New Zealand recently established by the Arts Foundation. O’Connor continues to collaborate with scientists and is currently working on a commission with award winning physicist Professor Shaun Hendy. The artist would like to acknowledge the generous support of; the individual Boosted campaign funders, Shio Otani, Martin Kwok, Corban Estate Arts Centre, Craig Stevens, Ben Stevens, Katharine Allard and the installation volunteers; Elaine, Anne-Sophie, Jane l, Jane P, Francis, Alamein, Kenneth, Rainer, Urmilla, Vanessa, Jacqueline and Brigette.